France head coach Marc Lievremont is holding his nation's media responsible for the "detestable atmosphere" surrounding his press conferences in New Zealand. Lievremont's already strained relationship with the French press has only worsened in recent weeks and it reached its nadir after Saturday's defeat by the All Blacks at Eden Park. Or so it had been thought, because the animosity between the two parties only intensified during a press conference in Auckland on Sunday. 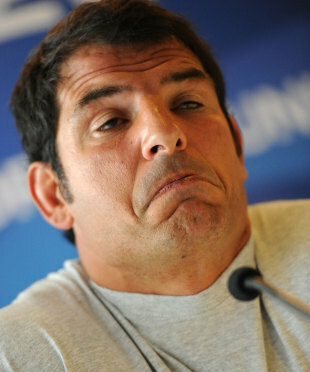 When asked if his side could recover from their comprehensive loss to the All Blacks and go on to win the World Cup, Lievremont flew into a rage. "Go to hell with your question," the former French international said. "We just shipped 40 (points) - it's twisted to think like that. We're first going to think about qualifying (for the quarter-finals). Lievremont then claimed that those in attendance were solely responsible for the complete breakdown of the relationship between the coach and the media. "I really regret the detestable atmosphere that we have at these press conferences," he said. "I am sorry that we cannot work together in a climate of confidence and have exchanges that are useful for both sides. For a long time I hoped this would be the case but manifestly it is not. "Often I come out (of the press conference) annoyed and upset because I sense this atmosphere." Lievremont explained that his primary objective now is to ensure that the "detestable atmosphere" created by the media does not pervade his squad ahead of Saturday's clash with Tonga. "I have just got to take it all on the chin and make sure that it does not pollute my squad and my relations with my players. That is the most important thing," he said.